Mr. Thirawit Leetavorn, Double A Senior Executive Vice President (2nd from left) and Professor Philip Kotler (2nd from right), world renowned Marketing Guru and founder of World Marketing Summit (WMS), announced the global partnership to promote the idea to “create a better world through Marketing”. 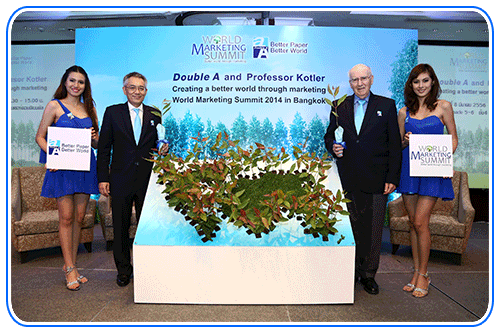 Bangkok, Thailand, 11 March 2013 – Double A, Prof. Philip Kotler and the World Marketing Summit join hands to promote the idea of creating a better world through marketing. “This partnership highlights our commitment to creating a better world for all. With our common goals, Double A will assist Prof. Kotler and WMS in promoting a better world through marketing”, said Mr. Thirawit Leetavorn, Double A Senior Executive Vice President. Double A’s sustainable business model is founded on a clear vision to create a good paper that does good to the community and environment. This business model which is based on 3 pillars - Environmental Sustainability, Social Sustainability and Economic Sustainability – is consistent with the goals and ideals of WMS. Double A has been a major contributor to the improvement of livelihood and income of Thai farmers. Double A’s Paper from KHAN-NA program engages 1.5 million farmers across Thailand to plant trees along the empty space between their rice paddies thereby generating additional income to supplement their income from rice cultivation. With this initiative, Double A was presented with the Asian Corporate Social Responsibility (CSR) Award for Poverty Alleviation in 2011. Double A plants 390 million trees through Paper from KHAN-NA that absorb 6.7 million tons of carbon dioxide per year and utilizes all of its waste to produce steam and bio-mass energy for its mill. Double A’s model is an example of a unique approach for a business to live well with nature and the community. According to Prof. Kotler, “Double A is a good paper that does good to the community and environment while doing well. Double A’s business model represents the future of marketing – one that sustains the community, economic growth and environmental balance while achieving a global brand status. Double A is a company that portrays how a business can live well with nature and create shared value with the community, all while being profitable. This impressive business model is the key to Double A-WMS partnership. Double A and WMS will be working closely with key stakeholders from around the world in fighting poverty, promoting environmental consciousness and advancing the Millennium Development Goals to create a better world through marketing in the years to come”.